GrabGreen Delicate Laundry Detergent - 24 per pack - 6 packs per case. Product prices and availability are accurate as of 2019-04-02 13:37:04 EDT and are subject to change. Any price and availability information displayed on http://www.amazon.com/ at the time of purchase will apply to the purchase of this product. 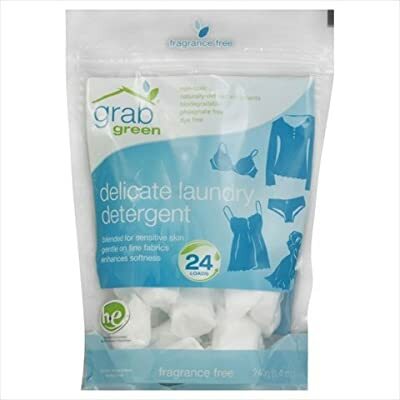 GrabGreen Delicate Laundry Detergent - 24 per pack -- 6 packs per case. Caring for delicate and fine washable fabrics is simple using our Delicate Laundry Detergent. The gentle formula enhances softness, cleans beautifully and is lovely for those folks with super sensitive skin. Also a perfect fit for stuffed animals, blankets, and baby items. GrabGreens eco friendly formula is fabulous for fabrics requiring hand washing and works with both high efficiency HE and standard machines. A pouch contains 24 pre measured concentrated powder pods. Theres no over pouring detergent here which means no more wasting detergent or money. Our hypo allergenic formula is fragrance, dye, phosphate and chlorine free. Leaves zero residue on clothing Great for those with allergies and sensitive skin. Safe for septic systems. GrabGreen is critter friendly no animal testing with our products.